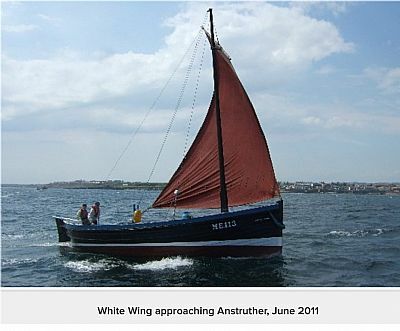 White Wing (ME 113) is a Baldie, a single masted variant of the Fifie lugsail design which was popular on the East coast of Scotland from the 1850s until well into the 20th century. 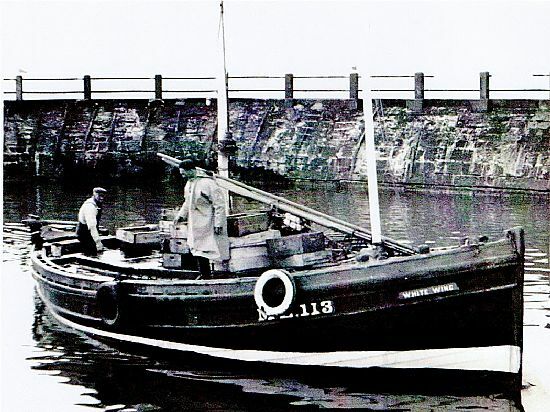 The Maggie Law Database of ME Registered Craft describes her as having been built in Gardenstown in 1917 and first registered in Montrose in 1942 with Robert Gowans and Robert Davidon named as joint owners. Of 7 tons displacement and length 33 feet she is powered by motor and lug foresail and crewed by four men. 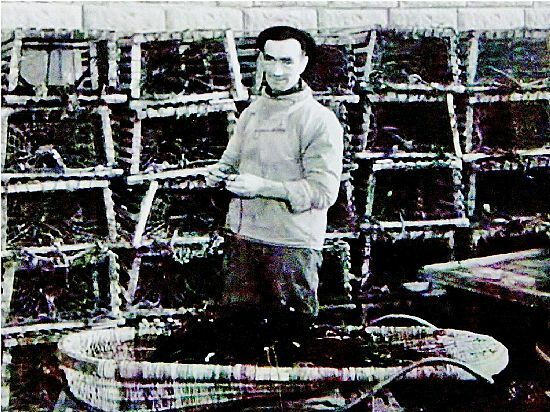 In 1953 she was acquired by David Lownie and his brother Andrew Lownie of Gourdon. Ms Ruth Macaulay (nee Lownie) is the daughter of David Lownie and has provided the photographs shown in the gallery below. These together with the captions added by Ms Macaulay form a first hand record of White Wing's time in Gourdon. Ms Macaulay records how the two brothers fished with creels for lobster and crab during the summer months and with lines for cod and haddock during the winter months. 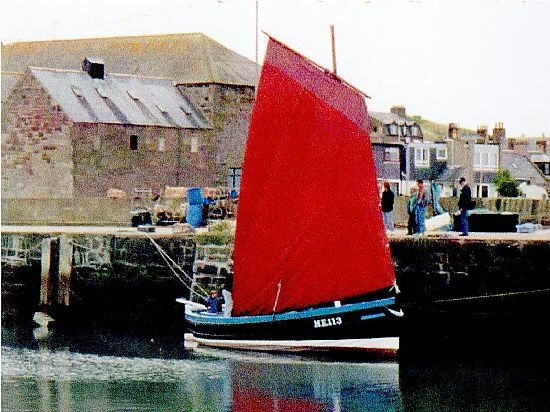 Andrew retired in 1975 but David continued fishing until the boat was sold in 1986. David Lownie raiding his lines. Photo taken in the early 60s in front of Stephen's fish house. 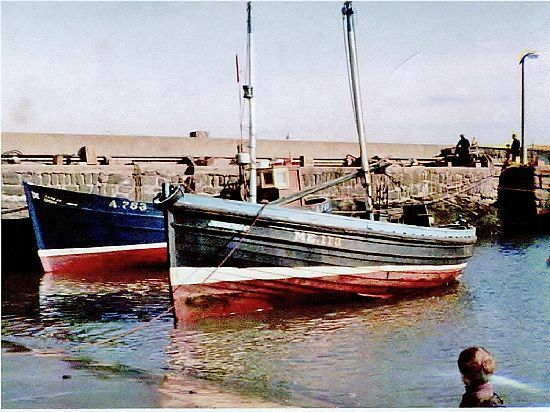 David and Andrew returning to harbour some time in the early 60s. 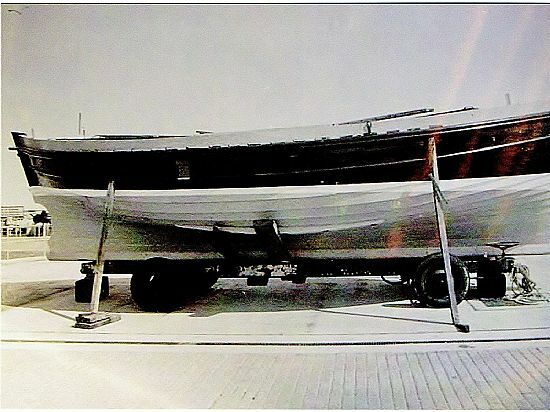 The boat in April 1973 beached to be repaired or painted. 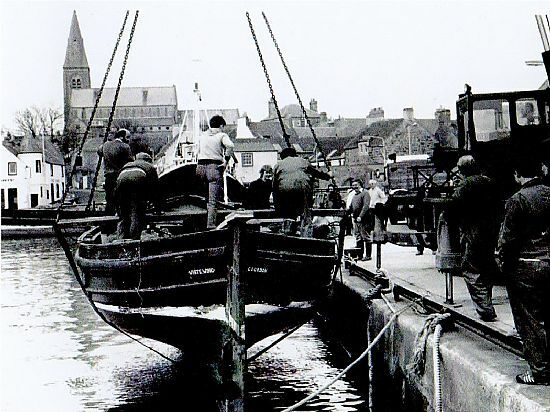 The boat being lifted out at Anstruther to be rebuilt/refitted. Back in Gourdon after being rebuilt. She returned for the Lifeboat Gala day of 1998. 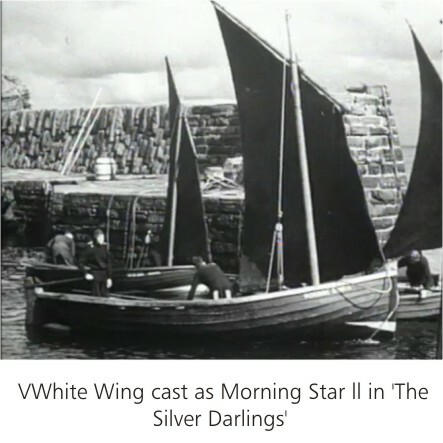 After a period as a movie star featuring in the 1947 film 'The Silver Darlings', White Wing moved to the Scottish Fisheries Museum at Anstruther and underwent substantial restoration work.